Paramount’s initial Star Trek Into Darkness Blu-ray release left many fans disappointed with the lack of bonus features included with the film. 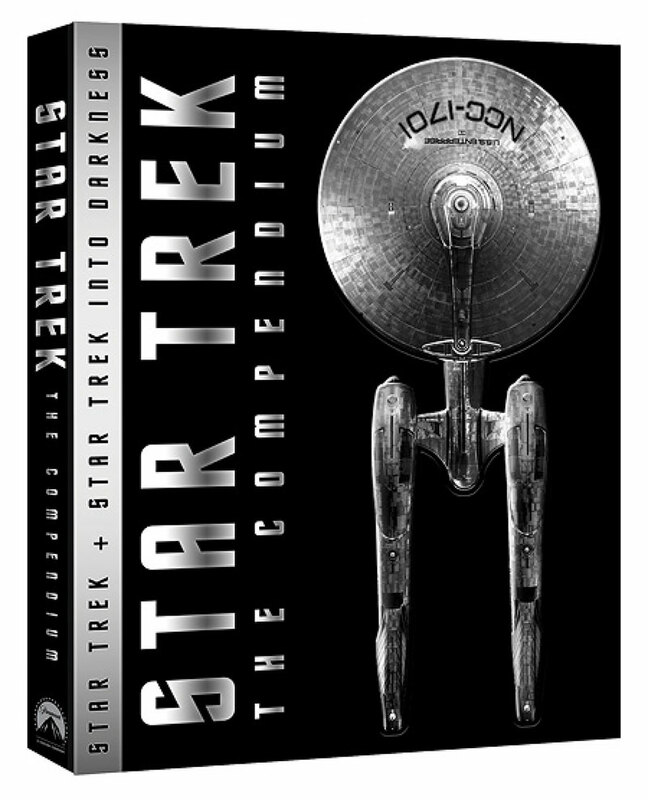 The release of Star Trek: The Compendium, a new Blu-ray box set, scheduled to be released later this fall, should remedy those concerns. The new 4-disc set will compile a 2-disc Star Trek (2009) Blu-ray along with all of the bonus features that were originally included with that release with a 2-disc Star Trek Into Darkness Blu-ray special edition. According to a report on Digital Bits, the first disc of Into Darkness Special Edition will include the IMAX version of the film along with enhanced audio commentary, with director J.J. Abrams, VFX supervisor Roger Guyett, co-producer Tommy Harper, composer Michael Giacchino, editors Maryann Brandon and Mary Jo Markey, D.P. Dan Mindel and second unit D.P. Bruce McCleary, producer Bryan Burk and writer/producer Damon Lindelof. Plus, “Creating the Red Planet”, “Attack on Starfleet”, “The Klingon Home World”, “The Enemy of My Enemy”, “Ship to Ship”, “Brawl by the Bay”, and “Continuing the Mission”, the Target-exclusive featurettes, “The Voyage Begins… Again”, “Rebuilding the Enterprise”, “Vengeance Is Coming”, “Mr. Spock and Mr. Spock”, “Kirk and Spock”, and “Visual Affection”, trailers, and all 6 Best Buy/Cinema Now-exclusive featurettes, “Down with the Ship”, “National Ignition Facility: Home of the Core”, “Safety First”, “Unlocking the Cut”, “The Sound of Music and FX”, and “Aliens Encountered”. In addition, all-new deleted scenes, an new photo gallery, a gag reel, and two new featurettes, “Fitting the Future” and “Property of Starfleet” will also be included. Scheduled to be released in September, it was noted that Paramount is working on a rebate offer for those who purchased the original Star Trek Into Darkness Blu-ray. We’ll have details on that as they become available. For a complete disc-by-disc rundown, check out the press release below. • To Boldly Go — Taking on the world’s most beloved science fiction franchise was no small mission. Director J.J. Abrams, writers Roberto Orci and Alex Kurtzman, producer Damon Lindelof, and executive producer Bryan Burk talk about the many challenges they faced and their strategy for success. • Casting — The producers knew their greatest task was finding the right cast to reprise these epic roles. The cast, for their part, talk about the experience of trying to capture the essence of these mythic characters. The piece concludes with a moving tribute to Leonard Nimoy. • A New Vision — J.J. Abrams’ vision was not only to create a Star Trek that was a bigger, more action-packed spectacle, but also to make the spectacle feel real. Every aspect of production—from unique locations to the use of classic Hollywood camera tricks—was guided by this overall objective. • Starships — Abrams and production designer Scott Chambliss were careful to pay tribute to the design of the original Enterprise, but they also wanted to make it futuristic and cool for a modern audience. This chapter focuses on the unique stories behind the creation of the film’s starships. • Aliens — Designers Neville Page and Joel Harlow talk about the hurdles they faced creating new alien species, recreating the Romulans and Vulcans, and designing the terrifying creatures on Delta Vega for the new Star Trek. • Planets — From the frozen landscape of Delta Vega to the desert plains of Vulcan, Scott Chambliss and the art department had a number of radically different planets to create. Abrams’ desire to shoot on real locations whenever possible led the production team to a number of strange and surprising locations. • Props and Costumes — Property master Russell Bobbitt had the unique challenge of designing props that were both true to the original series and pertinent to today’s technology. Likewise, costume designer Michael Kaplan talks about how he designed costumes that paid homage to what came before yet were relevant and timeless. • Ben Burtt and the Sounds of Star Trek — When famed sound designer Ben Burtt was hired to create sounds for the first Star Wars film, he took his inspiration from the original Star Trek series. Burtt jumped at the opportunity to pay tribute to the sounds that sparked his career with the sounds he created for the new Star Trek. • Score — As a fan of the original series, composer Michael Giacchino embraced the challenge of creating new music for Star Trek while preserving the spirit of Alexander Courage’s celebrated theme. • Gene Roddenberry’s Vision — J.J. Abrams, Leonard Nimoy, previous Star Trek writers and producers, and scientific consultant Carolyn Porco describe and commend the optimistic and enduring vision of Gene Roddenberry. • Starfleet Vessel Simulator — Explore extensive data on the U.S.S. Enterprise and the Romulan ship, the Narada. Submerse yourself in breathtaking 360° views and close-ups and review detailed tech information. • The Voyage Begins… Again — Go behind-the-scenes as filming begins on the next Star Trek adventure. • Creating the Red Planet — Experience the creation of a never-before-seen alien world, as featured in the action-packed opening sequence of the film. • Rebuilding the Enterprise — See the design and construction of a bigger, interconnected Enterprise set. • National Ignition Facility: Home of the Core — Location shooting at the National Ignition Facility. • Attack on Starfleet — Go behind the scenes with the cast and filmmakers and witness the creation of the shocking attack on Starfleet Headquarters. • Aliens Encountered — The design and application of alien makeup. • The Klingon Home World — Discover the stunning world of Kronos, and see how the filmmakers reinvented the Klingons for a new generation. • The Enemy of My Enemy — Find out how, and why, the identity of the film’s true villain was kept a mystery to the very end. • Vengeance is Coming — A comprehensive look at the design and production surrounding the black ship. • Ship to Ship — An in-depth and thrilling look at the filming of the iconic space jump sequence, which both defied the laws of physics and pushed the limits of visual effects. • Mr. Spock and Mr. Spock — Leonard Nimoy makes a cameo appearance and reflects on his history with Trek. • Down with the Ship — Discover the stunt & VFX work involved to make the Enterprise roll over. • Kirk and Spock — Explore the dynamic relationship between the film’s heroes. • Brawl by the Bay — Sit in with Zachary Quinto and Benedict Cumberbatch as they revisit their intense preparation for the film’s breathtaking climax. • Continuing the Mission — An inspiring look at the partnership between the film’s crew and the organization that assists returning veterans to find meaningful ways to contribute on the home front. • Unlocking the Cut — A discussion with the film editors about their monumental task. • The Sounds of Music (and FX) — A discussion with film composer Michael Giacchino and sound designer Ben Burtt. • Visual Affection — A comprehensive look at the creation and implementation of visual effects. • Safety First — A prank pulled on the cast. • NEW! Fitting the Future — A look at the film’s out-of-this-world costumes. • NEW! Property of Starfleet — Sourcing and tracking the film’s myriad props. 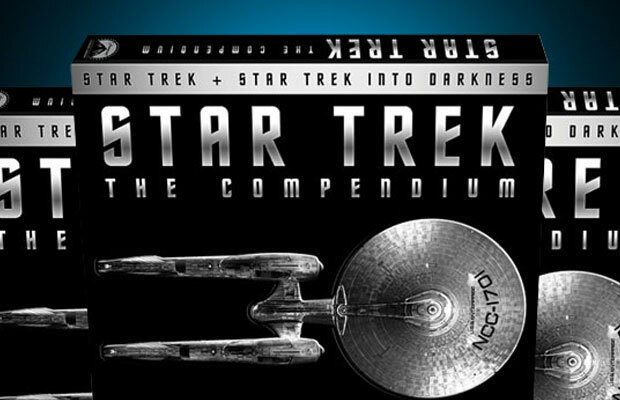 Stay tuned to TrekNews.net for more on the Star Trek: The Compendium Blu-ray release.